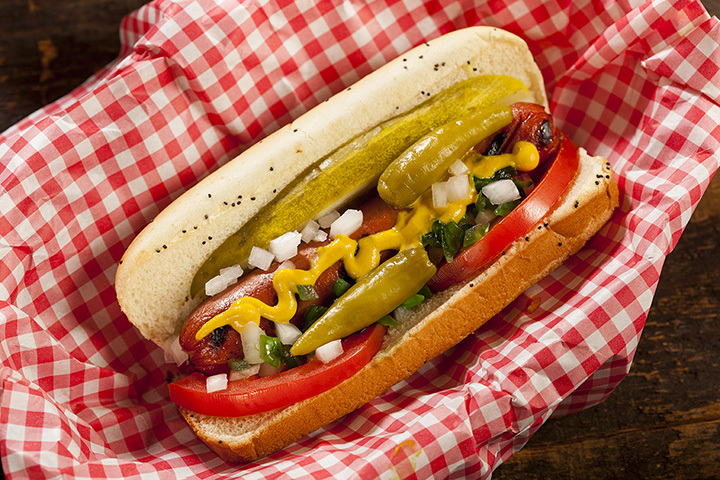 Hot dogs aren’t just a New York tradition. Look a little bit further north and you’ll find Rhode Island, a New England haven for dive hot dog shacks and even gastronomic homemade sausages. Perfect for a late-night snack or an inexpensive lunch, you’ll love these hot dog joints in Rhode Island. This establishment is a Rhode Island institution. Order a hot wiener—and be warned, they are wieners and not hot dogs—and make sure to get it “all the way.” Complement your wiener with some fries and a coffee milk on the side. This is bound to be the best wurst you’ll ever taste. Take a bite into the bacon cheddarwurst and be prepared for hot cheddar to ooze out, exploding with flavor. If you ever find yourself Friday in front of Roger Williams Park, make sure to enjoy one of their many varieties of homemade sausages! This is pub fare at its finest. While you’re playing shuffleboard, air hockey, or pool, make sure to grab a mac and chili dog—that’s two whole hot dogs on the bun with layers of macaroni and cheese, chili and fried onions on top. At this no-cash mom-and-pop place, enjoy a classic wiener with service that can’t be beat. The owners will greet you at the door and make sure that this dog experience is one you won’t forget. The “original” food truck, the Haven Bros. Diner has graced the streets near Kennedy Plaza for years. They’re one of the only places in Providence open past 2 a.m., but Haven Bros. isn’t a last-ditch choice. Their dogs are classic—served in a piece of bread rather than a bun. Make sure to order a side of fries, too, and enjoy the old-timey diner atmosphere! Open until 3 a.m. on weekends, you won’t regret this kind of late-night decision. While Baba’s might look like a dive, the kitchen is pumping out fresh food nightly—hot dogs upon hot dogs covered in mustard, meat sauce, onion and celery salt. Grab coffee milk on the side, and if you’re not in the mood for a wiener their grilled cheeses are great, too. Looking for a more upscale sort of sausage? Make sure to try one of Chez Pascal’s house-made wursts, all from the setting of a traditional French restaurant. Just open for lunch, the Wurst Kitchen is perfect for grab and go or a relaxed stop for sausages. Try the meatloaf sandwich, too—it’s a cut above the rest. You’ll immediately notice this dive of a hot dog shack from its firehouse red color. Thought it’s been in service for years, the greasy food and low prices remain almost the same. The perfect late night hot dog place, Firehouse doesn’t just serve wieners—they’ve also got amazing chili cheese fries and steak sandwiches. With a kitschy atmosphere and an enormous array of hot dog variations, you won’t be disappointed by this hot dog joint. Locals love the German Shepard and their freshly baked rolls. They even have options for vegetarians, too!